House was built in 2007 and has Title Deeds! Built by Kerrano Developers. The street is residential and has new large houses built recently. 4 double bed rooms, 2 with ensuite shower rooms, 1 extra large bathroom with bath, shower cubicle, bidet, toilet and sink. All bedrooms have fitted wardrobes. Light fittings, blinds and curtains. Large lounge / dining room with downstairs WC, under stairs cupboard. Veranda doors out to front terrace. Central heating and air-conditioning throughout. UPVC double glazed windows and doors. Only 1 owner, built to owners specification and excellent quality. Large kitchen, breakfast / tv room. With adjacent Laundry room – large enough for tumble dryer, washing machine and fridge freezer. Double doors out to pool terrace / garden. Side door to car port. Each bedroom has access to a veranda and ample lighting. Car port and long drive to side of house. Veranda for dining, BBQ area, grass area, small pool with small picket safety fence. Beautiful views at the front of fields and the back garden backs onto a path way and row of pine trees so no other houses looking in. Decoration is modern and tasteful. The owners are young with a young child and no pets or smoking. 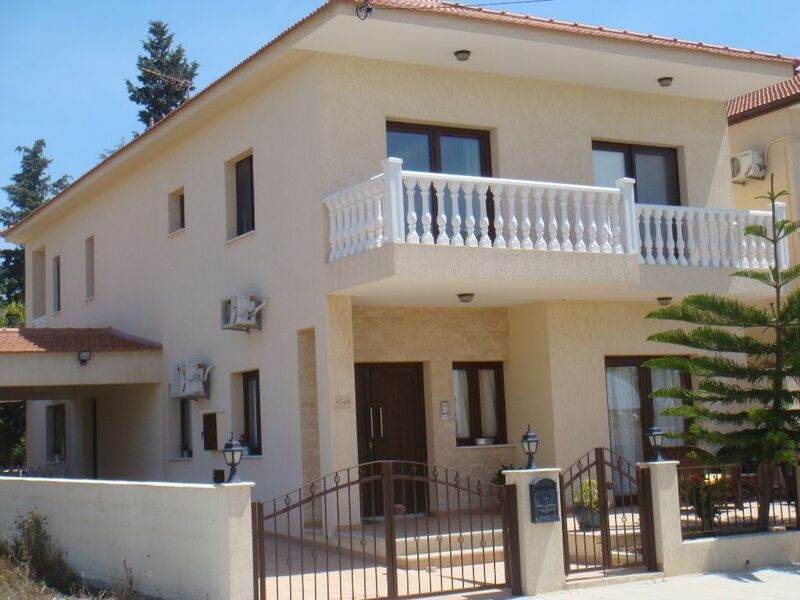 Meneou is a beautiful up and coming village 5 minutes from Larnaca International Airport. 5 minutes from the sea, 12 minutes from the main town centre. Meneou has many supermarkets, restaurants, chemists, clothes shops, schools, restaurants, banks, hairdressers, petrol stations and post office. It is very near Kiti, Pervolia and Dromolaxia. 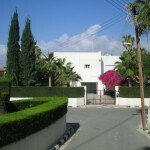 It is 30 minutes from Nicosia – Cyprus capital. The property is situated in the new part of Meneou, 5 years ago it was vineyards and farm land. There are still lots of fields with views to the mountains.